There has been an explosion of interest in the new generation of 6.5mm cartridges. While American hunters and riflemen in years past shunned the .264" bore size, there has been an abrupt change in thinking. It seems the performance potential of this 6.5, combined with long, high ballistic coefficient projectiles, can no longer be ignored. Cartridges like the .260 Rem., 6.5mm Creedmoor, 6.5mm Grendel, 6.5x47mm Lapua and .26 Nosler have all gained the attention and interest of American riflemen. Even so, this article is not about a 6.5mm cartridge. Instead it is about Mark LaRue of LaRue Tactical and bringing a .25 cal. wildcat to market. OK, so how did I get from 6.5mms to the quarter bore? Well, like many, Mark is a fan of the 6.5mms. He offers the .260 Rem and most recently added the 6.5mm Grendel to his line. 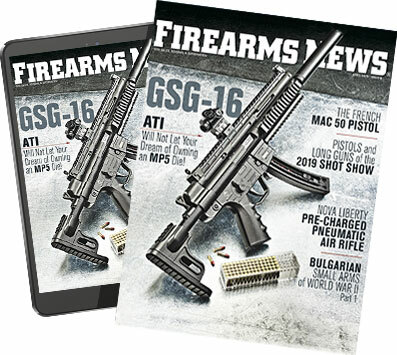 But while looking over factory offerings he noted what he considered to be a "glaring gap in factory offerings derived from the .308 Win." What did he mean by this? Simply that here was no quarter bore to be found. You should understand Mark grew up hunting and shooting with an old Savage Model 99 lever gun chambered for the classic .250-3000. Mark is a working man's working man. But he also has style. As a fan of the quarter bore, he decided to fix industry's omission of a proper .25 cal. cartridge based off the popular .308 Win. case. Like the .264 bore size, the .257 has been a minority taste, but the minority has been fervent. There have indeed been some truly excellent cartridges topped with .257" projectiles. The.250-3000 Savage was one of the first. Introduced in 1915, the .250 Savage made a name for itself through its scorching speed. It set a record by being the first U.S. cartridge to achieve 3000 fps. In 1934, Remington introduced the .257 Roberts, which would remain hugely popular for the next two decades. A necked-down 7x57mm Mauser, it proved just the ticket for varmints or deer-sized game. Roy Weatherby introduced what was to become his favorite cartridge, the .257 Wby. Mag., in 1944. This sizzled 80-grain bullets at almost 4000 fps while 120-grain slugs could top 3300 fps. Remington introduced the .25-'06 in 1969. As its name implies, this was simply a .30-'06 case necked down. Performance was impressive, its trajectory was flat, yet recoil was mild. While none of these quarter bore cartridges took the world by storm, all have ardent followers. When Mark LaRue started working on a quarter bore project of his own he selected the .308 Win. as the parent case. This made sense, as he was already building .308 Win. and .260 Rem. chambered rifles and the new cartridge would drop right in. Rather than reinventing the wheel, he decided to turn a popular .25 cal. wildcat, the .25-08, into a factory offering. The first .25-08 wildcat appeared in 1952, just a couple years after the .308 Win. was introduced. The first handloader to neck the .308 Win. down to .257 was P.F. Lambert of Washington, D.C. His creation was blessed with impressive accuracy, respectable exterior ballistics, relatively long barrel life and would fit into a short-action rifle. Unlike the 6.5mms though, the .25-08 can be loaded with light 75-grain projectiles for vaporizing varmints. Switch to heavier 100+ grain bullets and it performs very well on medium game. Overall it is a very flexible cartridge that shoots flat, hits hard but is very soft shooting. It remained a popular wildcat through the late 1960s but it never achieved the status of being factory loaded, until now. So what is LaRue chambering in .25-08? Well he is dropping his new round into the popular self-loading PredatOBR. It's built using a receiver set CNC machined from billet aluminum. Receiver fit is very good, but I was still able to push the take-down pin out with my finger, no tool required. The lower receiver is outfitted with one of LaRue's own Meticulously Built Triggers (MBT). Rather than use someone else's trigger system, LaRue designed his own two-stage trigger, precision machined from S7 tool steel. It provides a very clean 2.5-pound first stage, and then breaks crisply when you apply an additional 2 pounds to the second stage. Reset is short and positive. LaRue outfits this model with a H2 buffer assembly that rides inside the receiver extension. Riding on top of the receiver extension is LaRue's Retract Action Trigger (RAT) stock. This collapsing design features six positions to adjust length of pull and a non-slip pad. Hidden beneath the pad in internal compartments is a set of cleaning rods. This is actually g-whiz cool. The operating system is traditional Stoner with a rotating bolt. The bolt carrier assembly is both beefy and beautifully machined. LaRue did tweak the way the PredatOBR operates with the addition of a proprietary chamber system called XTRAXN. 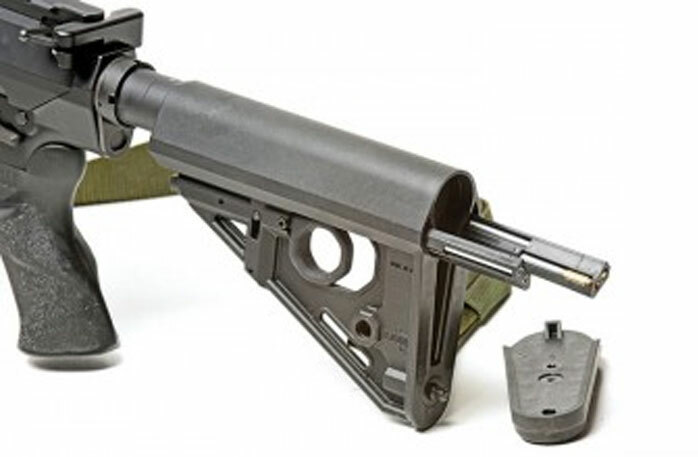 Basically, the rifle's chamber features shallow flutes that reduce frictional forces caused by pressure-expanded cartridge cases bearing against the walls of the chamber. The system is designed to ensure reliable extraction/function through a wide range of temperature and chamber pressures. In doing so, LaRue claims it also extends extractor life. Four barrel lengths are offered in 7.62x51mm: 14.5, 16.1, 18 and 20 inches all with a 1:10 twist. Two lengths are offered in .25-08 and .260 Rem: 18 and 22 inches, both with a 1:8 twist. My review rifle wore a 22-inch barrel. It tapered from 1.16 inches just in front of the barrel nut to .79" at the rear of the gas block and .73" at the rear of the muzzle device. As I was examining it I noted a "Rearden Steel" mark. Anyone who has read Ayn Rand's famous 1957 novel Atlas Shrugged will recognize this. If you haven't heard of it, spend a moment doing a web search, or better yet read the book. Surrounding the barrel is a CNC-machined aluminum handguard. This features a MIL STD 1913 rail at 12 o'clock and threaded stainless steel hard points at the 3, 6 and 9 o'clock positions. These hard points allow 1913 rail sections to be easily added where needed. The hard points have an integral "spine" machined in to provide structural support under hard use. Three 3-inch long rail sections CNC machined from billet aluminum are provided with the rifle. Examining the handguard, you will notice two stainless steel QD levers, one at 3 and the other at 9 o'clock. These, rather than the barrel nut, are used to lock the handguard securely to the upper receiver. In doing so this design creates a true free-floated barrel. 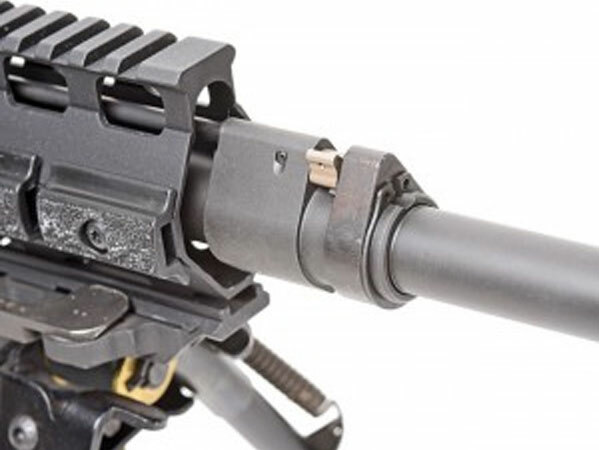 Fitted to the barrel is LaRue Tactical's proprietary Port Selector Technology (PST) dual position gas block. The gas block has two positions, one for unsuppressed and the other for suppressed fire. A low-profile lever allows the shooter to toggle back and forth easily between the two settings. When a sound suppressor is fitted, the rifleman needs only to rotate the lever to the right side of the rifle. Doing so reduces the amount of gas injected into the action. This compensates for the additional blowback created by having a sound suppressor mounted. For unsuppressed fire, rotating the lever to the left side of the rifle increases the amount of gas injected into the action, allowing proper reliable function. LaRue Tactical's TranQuilo muzzle brake/sound suppressor adapter comes standard. This unit acts as a conventional muzzle brake to reduce felt recoil and muzzle movement. In addition, it also acts as a mounting adapter for LaRue Tactical's TranQuilo sound suppressor. The TranQuilo was specifically designed for the Larue family of semi-automatic precision rifles and reduces the report to hearing safe levels and almost eliminates flash. What sets this unit apart though is its Safer Operator Technology (SOT) which reduces gas blowback emitted from the ejection port. Manufactured from 17-4 PH Stainless Steel and Incoloy A-286, the TranQuilo is 8 inches in length and weighs 23 ounces. If you would prefer a different muzzle device, all .25-08, .260 Rem and 7.62mm NATO barrels are cut with standard 5/8 x 24 threads at the muzzle. This allows the rifleman to choose from a wide variety of aftermarket muzzle devices. LaRue Tactical's PredatOBR stands out from the normal AR crowd as a takedown rifle. Yes, you can easily disassemble it for stowage and discreet carry. Takedown rifles have always had a certain mystique and appeal to them. The PredatOBR comes apart easily, and stripped down, makes for a relatively small package. LaRue even offers a well thought out six pocket "tool roll" the disassembled rifle, dismounted optic and accessories can be stored in. The tool roll can be slipped inside a matching metal "toolbox" for discreet transport and well-protected lockable storage. To remove the barrel assembly, begin by ensuring the piece is unloaded and the bolt is locked to the rear. Next, rotate the locking tabs that retain the QD levers on the handguard. Then release the QD levers and pull the handguard from the receiver and off the barrel. Using the supplied barrel wrench, loosen the barrel nut and then spin it off by hand. The entire barrel assembly may now be pulled free from the receiver. To reinstall, insert the gas tube/barrel into the upper receiver and tighten the barrel nut by hand. Use the wrench to torque the barrel nut another 1/8 turn (applying approximately 40 to 50 foot-pounds of torque) past hand tight. Then reinstall the handguard. LaRue claims a point of impact (POI) shift of between 0 and .5 moa. LaRue decided he would not only chamber rifles and barrels in .25-08, but he would also offer factory loaded ammunition. This is a big step for the man from the Dead Center of Texas. He expects other companies will offer .25-08 rifles and ammunition as riflemen recognize the potential of his new quarter bore cartridge. I received two 50-round boxes of preproduction LaRue Tactical ammunition for a first look. This was loaded using CorBon cartridge cases proudly wearing a correct .25-08 headstamp. The initial factory load features a 110-grain Nosler Accubond bullet. Nosler's .257" 110-grain Accubond projectile has a sectional density of .238. The G1 Ballistic Coefficient is .418. The projectile has an overall length of 1.18 inches. This design has a white polymer tip to improve aerodynamics. Polymer tips can be made very consistent and so aid accuracy as well as initiating expansion. As its name suggests, this is a bonded core design with a tapered copper alloy jacket. It's designed to provide reliable expansion with deep penetration. Expansion typically occurs with impact velocities as low as 1800 fps. While the Accubond resembles another famous Nosler design, the Ballistic Tip, it's quite different. The Accubond is first and foremost a big game bullet that will rival Nosler's groundbreaking Partition in penetration. Keep in mind that it was the Partition's reliable performance that started John Nosler on his way. In addition to this though, the AccuBond offers the aerodynamics, efficiency and accuracy of a Ballistic Tip. This is quite a combination. Back in 2003 I had the opportunity to be one of the first people to ever hunt with the Accubond when Winchester first offered it in factory ammunition. I took a nice 5x5 bull elk with a single shot, and have been impressed with the design ever since. Testing began with firing four five-shot groups from off a rest at 100 yards. This was done with a LaRue TranQuilo sound suppressor mounted. Recoil is very light and the .25-08 PredatOBR proved a comfortable piece to shoot. The TranQuilo did a fantastic job muffling the report, and it was very pleasant shooting without hearing protection. Accuracy was quite acceptable for a hunting load, averaging .75" groups. Velocity was zippy, with the LabRadar recording an average velocity of 2930 fps. Removing the sound suppressor shifted the point of impact .3" up in elevation. Reinstalling the suppressor put me right back to where I was. For the most part I find paper punching a bit boring, so I quickly switched to shooting on steel targets. I enjoy shooting from traditional positions, so started offhand and then moved to kneeling and sitting. The LaRue weighs in at 10.4 pounds without optic or magazine, so it's a bit on the hefty side when you add an optic, bipod, sling and loaded magazine. The sound suppressor adds a bit of length too. The LaRue operated very smoothly; rounds chambered easily, all the controls functioned without issue, and magazines ejected cleanly with the push of a button. Recoil is very mild and the rifle is very comfortable to shoot. Practical accuracy proved quite acceptable. I ran it on steel out to 500 yards and made quick work of my targets. The .25-08 proved both smooth shooting and easy to hit with. With a little daylight left, I switched to shooting prone off a Harris bipod at 800 yards. It was my first time playing with this cartridge and I skipped my first round low, shooting just beneath the steel silhouette. I held on the head and fired again. With the suppressor mounted, I could listen to the 110-grain Accubond whizzing through the air before it whacked the steel plate. The LaRue proved very consistent, even at this distance. I put 10 consecutive shots on steel at 800 yards and then repainted the plate. Next, I fired five carefully aimed shots just before I lost the light. Checking the 800-yard group, I found it measured a respectable 6 inches. LaRue's Accubond load should expand all the way out to about 600 yards where it retains a velocity of 1831 fps. Reliability was flawless throughout testing. Zero malfunctions or problems of any kind were experienced. I am impressed with LaRue's quarter bore; accuracy is very good and recoil is mild. Rumor has it Berger is working on a sleek .257" 115-grain Match bullet with a high BC. Mark said to expect .25-08 ammunition to be priced like .260 Rem loads. And a LaRue Tactical PredatOBR in .25-08? That will set you back $3,370. Mark LaRue has taken his Texas-based company on quite a journey since I first met him years ago. I'm interested to see what else he might have up his sleeve.